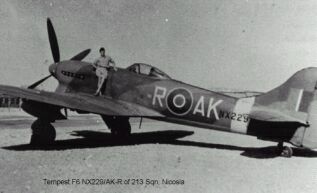 The Squadron continued to operate its much-loved Mustangs until the end of 1946 when it was re-equipped with the mighty Hawker Tempest. With a wingspan of 41 feet, a length of just over 34 feet, and a height of 15 feet 10 inches the Tempest was a large aeroplane for a single-seat fighter-bomber. Armed with four 20mm cannons and able to carry two thousand pounds of bombs, or eight 60lb rockets on under-wing pylons the Tempest could also deliver a power punch. 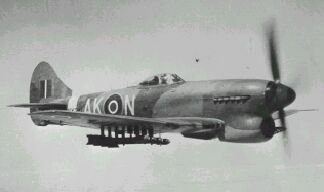 The Tempest F Mark IV with which the Squadron was equipped was in fact the tropicalised version of the MarkV. The essential modification was the removal of the oil-cooler from the aircraft's chin radiator and its relocation in the starboard mainplane, thus leaving the chin radiator solely for engine cooling. A Napier Sabre 5A in-line engine powered the aircraft, this power plant gave the Tempest a top speed of 440 miles per hour making it one of the fastest piston engined aircraft ever to have flown. By the end of 1949 the Tempests were beginning to show their age and the effects of operating in the harsh desert conditions prevailing in the Canal Zone and East Africa in general. So the news that the Squadron was to enter the jet age and re-equip with the De Havilland Vampire Mk V was greeted with some relief. During December 1949 the changeover was completed. In terms of top speed the Vampire was nearly one hundred miles an hour faster than the Tempest, its endurance however was considerably less. 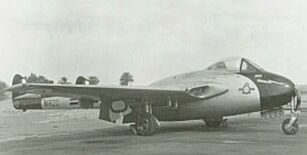 In terms of manoeuvrability, and particularly visibility, the Vampire also had a distinct advantage. 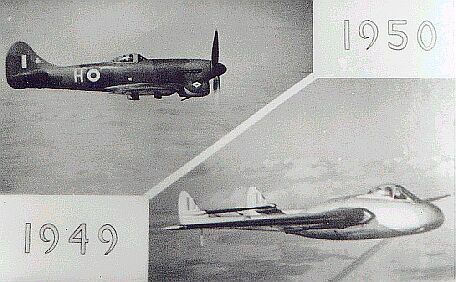 During the six years that the Squadron operated in the Canal Zone as a ground attack unit it operated a mixture of Vampire FB MkV and Mk. IXs. The illustration shows the CO's new vampire FB Mk. IX in its new livery, which replicated that used by the Squadron when it was reformed at Northolt in 1937. Canal Zone Fighter Defence Force.